As someone who has always loved wildlife and nature, an African safari has always been a dream of mine, one that for whatever number of reasons had yet to materialise. While it wasn’t technically my first time in Africa, a trip to Morocco many years ago might as well have been on another planet, let alone continent. Having watched so many documentaries and heard so many stories, I was very excited to be seeing the wilds of southern Africa for myself. Prior to starting my safari that would be hosted by African Bush Camps, I had a two-night stopover in Johannesburg, a city I knew little about. 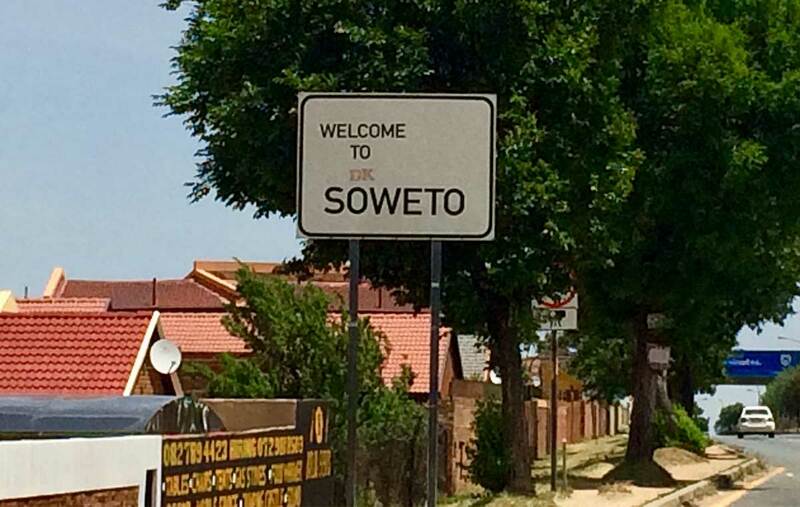 With the day I had in Jo’burg I made plans to visit the Apartheid Museum and the well-known township of Soweto. The Apartheid Museum was an eye-opener to say the least, it is hard to imagine the relentless struggle that the majority of South Africans went through during the decades under an apartheid government. Visiting Soweto showed the reality that many people in this country still face. While some areas of the township had decent housing and living conditions, many people here still live in abject poverty, either in the old hostels that were built for mine workers in the 1940s when the black population was forced out of the city, or in what can only be described as slums with corrugated iron, ramshackle dwellings, no running water or electricity and poor sanitary conditions. 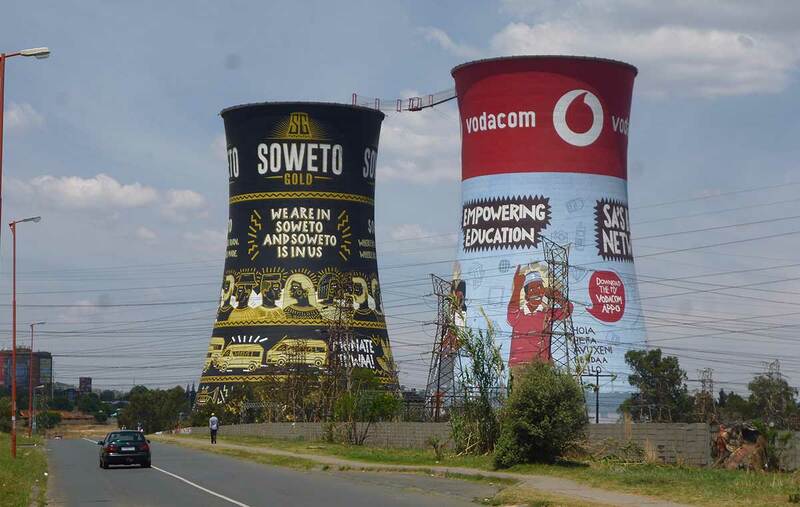 Soweto seems to be changing with more government-built housing cropping up, but it is happening slowly. The visit covered Vilakazi Street which is the only street in the world that was home to 2 Noble Prize winners. Desmond Tutu’s family still own and live in his house here, while the former residence of Nelson and Winnie Mandela is now a museum. I also made a stop at the Hector Pieterson Museum, named after a 12-year old boy who was shot by the police during the 1976 student protests. This museum focuses on the role students played in the struggle against apartheid. I found this day trip to be very interesting and would recommend it to anyone who has the time in Johannesburg. The following day it was time for the real adventure to begin. I flew out of Johannesburg to Maun in Botswana where I met the rest of my travel companions. Once we got into Maun we didn’t have to wait long to board our first light plane to the Khwai airstrip where we were met by our first guide, Banda. Before travelling to Africa, I’d been thinking about the animals I most wanted to see on safari. Leopard was very close to, if not right at the top of that list. What I didn’t expect, was to see one within 10 minutes of getting into a safari jeep for the first time, before we’d even reached our first camp. To see one as close as we did, just metres away from the jeep and with half an antelope wedged up a nearby tree, was a thrill to say the least. The day still had plenty more surprises in store, first sightings of zebra, kudu, lechwe, water buck, impala and of course elephants were all made, but the real icing on the cake was when another animal that would have been near the top of my list made an appearance. Just before sunset we were lucky enough to cross paths with a small pack of African painted dogs, 5 in all. They were resting in the grass, but as we watched they got up, had a bit of a pow wow and then skulked off into the bush to begin their evening hunt. 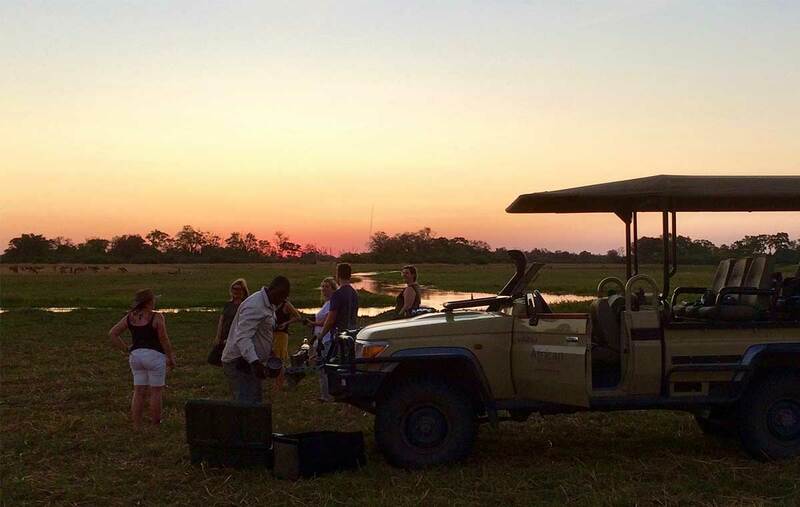 By the time we stopped for sundowners by the banks of the Khwai River, taking in the sunset while surrounded by elephants, antelope, zebra and hippos, I was a very happy camper indeed! The Khwai Bush Camp itself is a lovely place in a great setting on the eastern edge of the Okavango Delta. The rooms were spacious and comfortable with high ceilings and traditional style thatched rooves. The communal area had comfortable couches and a great deck to sit and watch the passing wildlife or gather around the fire at night and talk over the day’s activities. The great sightings continued throughout our stay at Khwai. 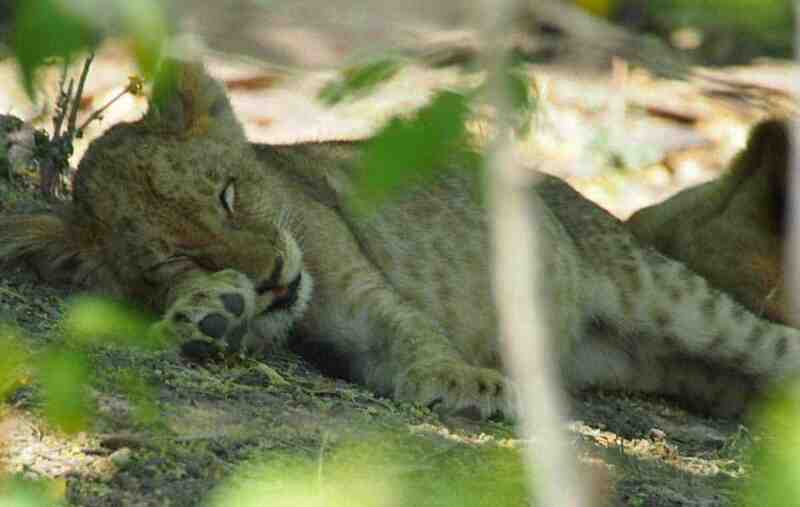 We crossed paths with lions for the first time, 2 lioness and a cub in the Moremi National Park. We saw some fascinating birds such as fish eagles and ground hornbills, enjoyed a mokoro ride which ended with a close encounter with a herd of young bull elephants and made after-dark sightings of Hyena and numerous bush babies (thanks to some impressive spotlighting skills). The staff surprised us with a bush dinner surrounded by lanterns in the middle of what seemed like nowhere, a great way to end the day. A close call with a huge bull elephant as we got out of the jeep back in camp provided one last exciting moment for the day. As we were saying our goodbyes after breakfast on our last morning at Khwai, we got a taste of nature in action. The wild dog pack we had seen on the day we arrived came past the camp, clearly in hunting mode. Banda leapt into action and we all piled in the jeep, heading off in the direction of the dogs. By the time we arrived they had made a kill, a young lechwe. Although we were barely 10 minutes behind, there was very little left by the time we arrived. The vultures had already descended to pick up the scraps, but it didn’t end there. While we watched the action unfold, two large crocs came out of the river to investigate, about 30 metres away from the dogs. Even though there wasn’t much left to steal by this stage, the dogs were having none of it. 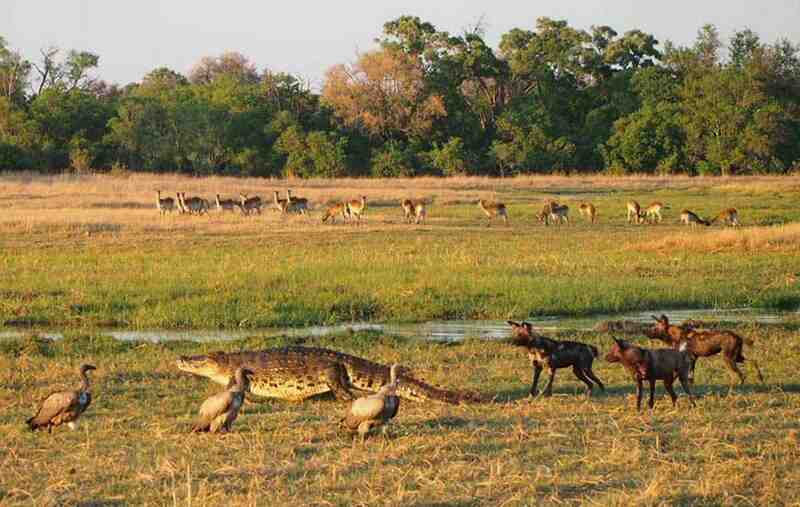 They stood up to the crocs and both reptiles ended up retreating back into the river. Easy to see why the dogs are such successful predators, they are ruthless and fearless creatures. After this incredible spectacle, we headed back towards the airstrip before setting out on our first walking safari. Knowing what lives in the surrounding bush, this was quite an experience. 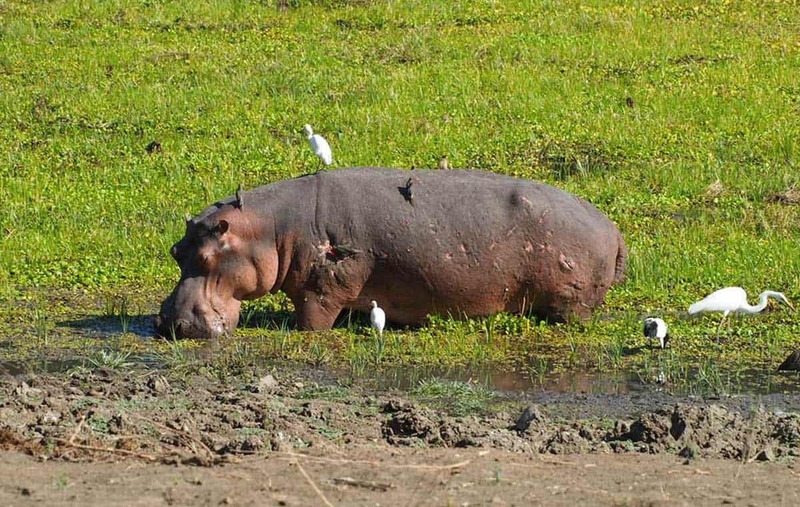 The guides made us feel very comfortable, although there were a few hearts in mouths when two hippos that we hadn’t seen made a dash out of the bush for the river, barely 15 metres in front of us. It was reminder that you always have to be alert in this environment. A 35-minute plane ride bought us to Linyanti. We set off with our new guide Dutchie, who delivered a wild dog sighting before we’d even lost sight of the airstrip, this time 2 dogs relaxing under a tree to escape the heat of the day. The first thing I noticed on arriving here was the change in landscape. The bush was thicker, but it bordered the open expanses of the Linyanti Marshes which bought us sightings of huge herds of elephants, at one stage there must have been well over 500 in view at one time. To get a better view we were taken up for a 30-minute helicopter trip which gave us expansive views across the wetlands to the Caprivi Strip in Namibia. From that viewpoint we could see hippos, zebra and buffalo as well as the abundant elephants that spend their days in the marsh. The camp at Linyanti was well located on the edge of the marsh and the small pool provided much needed relief from the heat of the day. 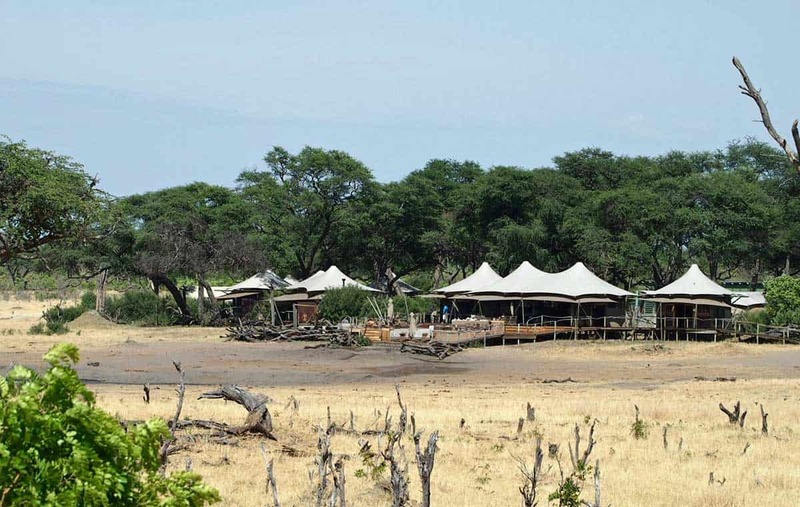 The wildlife was plentiful around the camp, from elephants, baboons and kudu, to birds, squirrels and the honey badgers that raided the fridge in the middle of the night. It was also great to eat some tasty traditional food when we had our boma dinner. The following morning, we did a 4km game walk. The fascinating thing about the walks is that you notice the little things that you don’t see from the jeeps. Our guide James 007 did an amazing job explaining things such as the importance of termites to the ecosystem and the different animal tracks that had been left the previous night. We then headed to the airstrip for our flight to Kasane, from where we were picked up to cross over the border into Zambia. Arriving into Thorntree Lodge it’s fair to say we were all pretty impressed. The tranquil setting on the banks of the upper Zambezi River, the luxurious suites with private decks and plunge pools, the sundowner pontoon on the river, there was definite wow factor here. It was thoroughly enjoyable to just sit with a cold beer and watch the sunset as a family of hippos gathered in the river just metres away. The next morning, we drove through Livingstone and crossed into Zimbabwe. We took a tour of Victoria Falls which was very impressive, even though the water levels are quite low at this time of year. We then went to Victoria Falls airport for our flight to Hwange National Park. To say this place is thick with elephants would be an understatement, on speaking to our guide Lionel we learnt that there are actually way more elephants in the park than is really sustainable, a difficult problem for a country that is making big efforts to protect its wildlife. We arrived at the gorgeous Somalisa Camp in the afternoon where we saw the pool that was built for guests but has since been surrendered to the elephants. On our evening game drive, we had our first encounter with male lions, coming into very close proximately with a small pride lead by two young males. We even witnessed them mating which was a blink and you’ll miss it kind of affair. 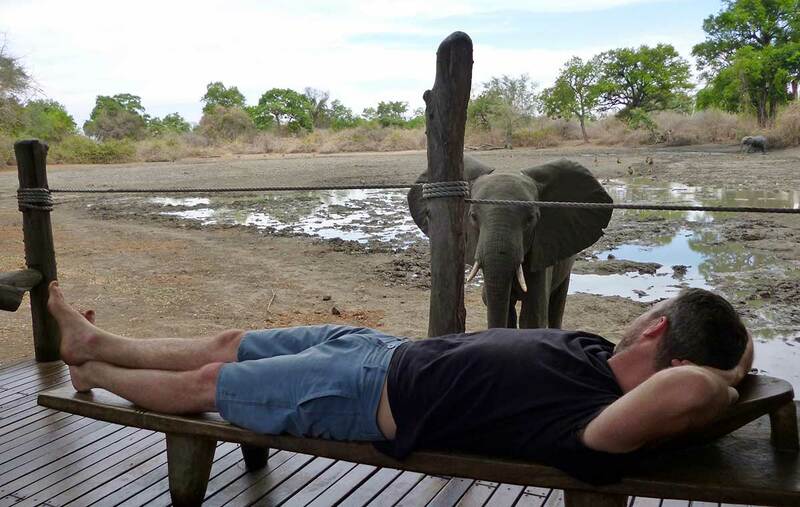 Back in camp we came to understand just how much use the elephants make of their pool. The park is very dry at this time of year with water that is pumped from bores into a few pans the only water around, except for the Somalisa pool. We spent a good five hours on the deck that night and had an almost constant stream of visiting herds coming and going from the pool. We did our best to drain the bar while the elephants drained the pool. Another day, another light plane flight. I was getting quite used it them by now, even almost enjoying them, almost. Next destination was Lake Kariba and the stunning Bumi Hills Safari Lodge. The views from this property were breathtaking, perched on top of a hill looking out over Lake Kariba, elephants wandering along the beach below. 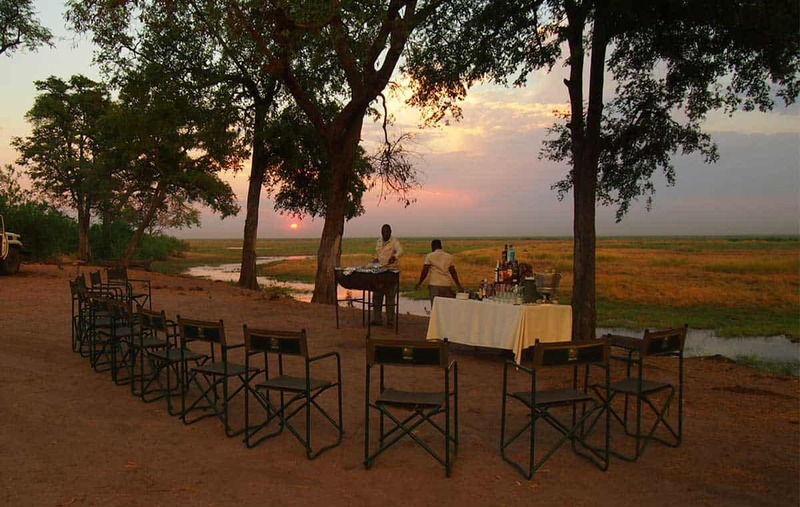 This isn’t necessarily somewhere you’d come specifically for the game viewing, more a place to break up the safaris and relax in the beautiful surroundings. They do however offer games drives as there is plenty of wildlife about, and boy did we get lucky. We had heard there were lions in the area and we located them near the airstrip. We then spent about half an hour watching a young lion and lioness stalking unsuspecting kudu and impala further along the strip, they got close, but it was ultimately an unsuccessful hunt. Still it made for exciting viewing and some good photos! From Lake Kariba we headed to our last destination, Mana Pools National Park. Here we stayed at two camps, starting with a night at Kanga Camp, famous for its “armchair safari”. The water pan out front of the lodge is the only fresh water for 15km in any direction at this time of year. From the time we arrived at around 2pm, until we crashed at about 10pm, there was a constant stream of visitors to the pan. Elephants of all sizes, eland, impala, baboons, buffalo and many different bird species. Then, after dark came the civets, leopard and hyena. This was an incredible spectacle to witness from the comfort of the couches and dining table on the deck above the water hole. On to our last camp, Zambezi Expeditions. While the facilities here may have been the most basic of all the properties we stayed at, the overall experience was up there with the best. 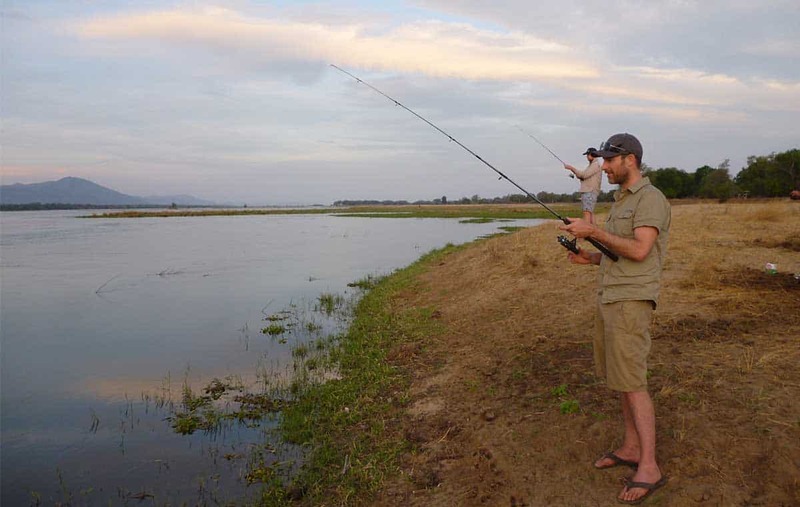 Our guide TK delivered wild dogs and leopard, we went fishing on the Zambezi which was a real highlight for me, catching a couple of fish was the icing on the cake (although I’m hoping for Tiger Fish next time). Canoeing down the Zambezi among the hippos and crocs was an unforgettable experience, Kingsley and TK made us feel as comfortable as you can while in a fibreglass canoe surrounded by some of Africa’s most dangerous creatures, and the cold beer at the end of the journey while watching the sunset over the river tasted extra good. That brought our journey to a close, back to the Mana Pools airstrip then onto Harare, Johannesburg and back to Sydney. While the trip is over, I have a much better understanding of what it’s like to take an African safari, a lot of great photos and more importantly memories that will last a lifetime. I’d like to thank Rob and Belinda at Ynot, Belinda you were a very gracious host. All the staff at every single one of the African Bush Camps properties, you made us feel so welcome and at home, I can’t say enough good things about you (special mentions to Comfort – the world’s best sommelier, Armstrong and Douphis for staying up late with Tom and I and making sure we got back to our tents alive, and Bread – just for being Bread!). All the guides throughout the trip, Banda, Dutchie, James 007, Lionel, Calvert, Ntando, Reggie, TK & Kingsley. You showed us and taught us so many amazing things, you seemed to have an answer for every question and you all had a great sense of humour, thank you all so much! I’ve definitely been bitten by the Africa bug (not just the tsetse flies) and can’t wait to get back there. 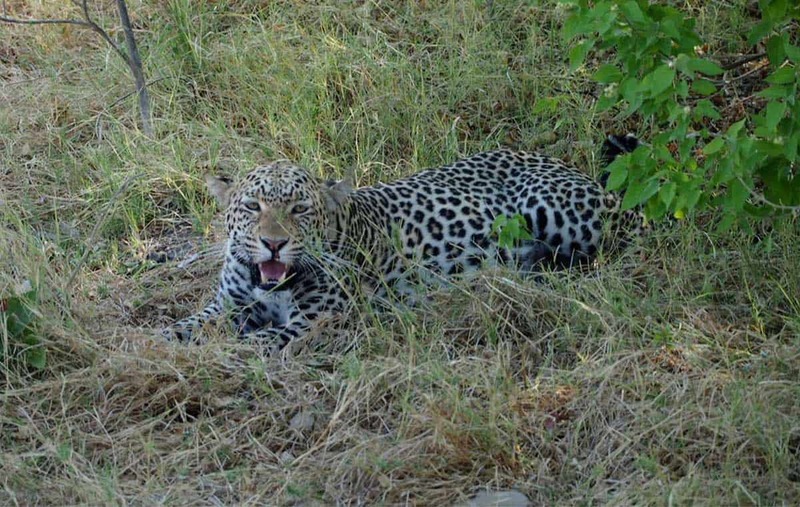 You can see the safaris and tours we offer to Southern Africa here. If you want to find out more about the destinations in this article, or have any questions in general please contact us.